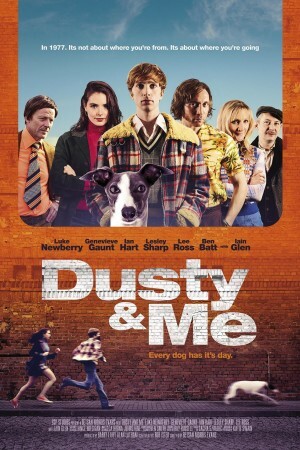 Dusty and Me is set in the North of England, Late 1970s. Young Derek is a bit of an outsider. His family are good old Northern stock, but Derek reads books and went and won a scholarship to go to a private school. Dereck’s eldest brother, Little Eddie gets him a job walking greyhounds. And what does Barry do? He only breaks every rule in the dog racing book by getting too attached to the dog. A useless mangy mutt called Slapper. And the pathetic creature turns out to be able to run like the wind. Her talent is noted not only by the girl of Derek’s dreams but also by an evil, vicious Gypsy Boss who kidnaps the dog to make himself a fortune. Slapper manages to escape the clutches of the Gypsy Bill and return to Derek. He hides her in his bedroom to recover from her beatings at the hands of the Gypsies. Once Slapper is getting back to full health, she goes berserk. As does Derek’s father Big Eddie. His mum comes to the rescue and encourages Derek to enter Slapper for at unofficial dog races. Will Derek stay out of the clutches of the vengeful Gypsy? Will Slapper win and will Derek win the girl?